Coarctation of the aorta is a narrowing of the aorta, classically (but not always) just distal to the origin of the left subclavian artery. 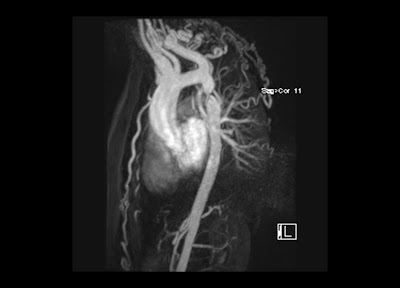 Here are ten key facts about coarctation of the aorta to be aware of in your cardiology clinic. After primary repair of coarctation of the aorta, long-term survival remains below that of normal controls, and the need for re-operation is relatively common. Patients should therefore remain under lifelong surveillance after surgical repair. Brown ML, et al. Coarctation of the aorta: Lifelong surveillance is mandatory following surgical repair. J Am Coll Cardiol 2013; 62: 1020-1025.